PH Rings - Fabulous rings for all occasions! PH Rings is one of the UK’s oldest wedding ring manufacturers supplying to high street jewellers across the UK. They required a new site which would replace their existing one as it was limited in scope and did not allow them to display their full product range. The new site was to be wholesale only and an essential element was an effective price management tool which would allow the client to respond quickly to changes in the market prices for precious metals. Our solution was to develop a custom site using the Pulse Solutions DNN Shopping Cart as a basis. A fully customised skin was developed to showcase the high quality product images and enable visitors to examine the pattern details. The rings are categorised by pattern type. Each of the 1,000 patterns is then available in different combinations of ring variants including size, width, profile and precious metal with pricing dependant on the combination of selected variants. End customers are able to select a ring pattern and choose the required profile, width and size from the options available for that pattern. The price for each precious metal option is then displayed. A currency module allows prices to be displayed in GBP, Euros or USD. Within their account area, the wholesale customers are able to enter a retail margin. 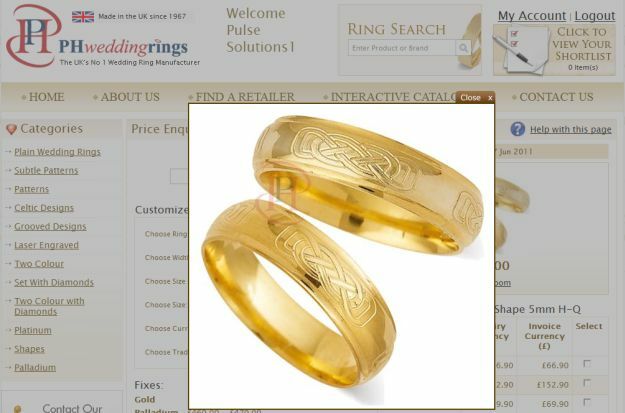 This allows them to use the website in their stores to demonstrate the full range of rings and display retail prices to potential purchasers. Rings can be saved to a wish list for order later. The website also has a Flash interactive catalogue to present the product range. Visitors can click through from these pages to the related website category. To enable regular updating of the prices a custom csv upload was developed. The csv receives data updates from the client’s legacy system from which product prices are created. The file can then be uploaded to the website database. The DNN pricing module has been customised to link with end customer accounts to provide personalised pricing for every customer. The client can update all static page content using the DNN content management system. Pulse DNN Cart - SupplySide.co.uk - Posters that inform and educate!